CreekFire Motor Ranch, a 105-acre RV campground oasis in Savannah, GA.
To promote their brand onsite and across the surrounding Savannah area, CreekFire Motor Ranch was looking for an affordable pop-up tent that could get the job done. Initially, they told us they wanted a tent design that was plain, simple, and not much else, not knowing about the outstanding capabilities that exist within our art and production teams. < a>We showed off our talents, that's what. Our sales rep, Erik, encouraged the client to consider the benefits of purchasing a 10x10 MONARCHTENT, the most durable pop-up tent in the market, printed on full UV polyester. Despite the steeper price point, CreekFire Motor Ranch ultimately decided to purchase the MONARCHTENT after learning about its battle-tested design, anodized frame, and 5-year warranty. It's a top-notch tent designed for top-notch companies, so it only made sense for them to go with the MONARCHTENT. In addition, our art team strutted their creative design talents by exceeding the client's expectations with a texturized and classy mock-up. 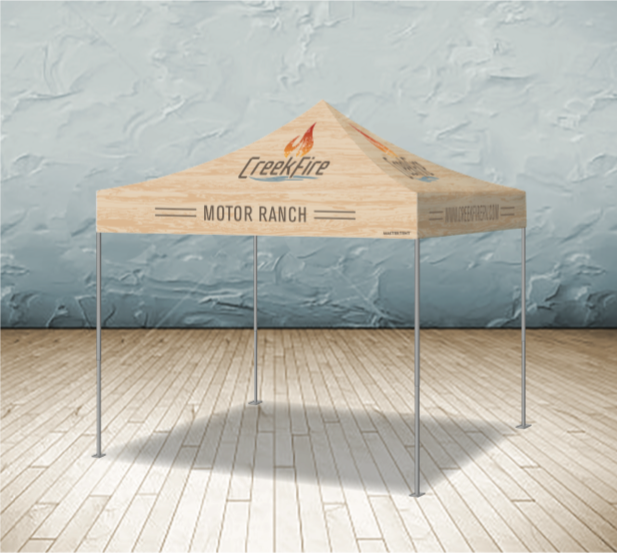 The client was seeking a plain tent, but because our art team always strives to surprise and delight our customers, CreekFire Motor Ranch ended up loving the custom design our artist, CJ, created for them. Finally, we designed, produced, and shipped the final product in three days. Yep, you read that right. It took us 72 hours to bring a customer's vision (and then some) to life. If that's not good customer service, I don't know what is. "I just want to say thank you... the tent is absolutely amazing...worth every penny. Very happy customer here... can not wait to show it off and tell people all about y'all..."